Accidentally delete or lost some important files from iPad, iPhone and iPod could be a panic thing for many people. So backup data on computer seems to be so important for iOS users. 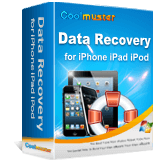 So, Coolmuster iPad iPhone iPod to Computer Transfer comes here to meet all iPad iPhone and iPod users' needs. Quickly transfer anything like contacts, SMS, videos, music, photos, etc. on your iPad iPhone or iPod to computer for backup. Filter and Quick Search Tools help you locate your target files at the shortest time. Two different view modes to meet users' different needs. Compatible with all generation of iPad, iPhone and iPod. This is a very good transfer software, easy to use. And it really help me lots in backing up and transferring files from my Apple devices to computer with ease. Magic!- Reviewed by Marie S.
You must have saved lots of precious photos or favorite songs, movies, etc. on your iPhone, iPad or iPod, right? Do you want to backup these precious memories on your computer to avoid losing data by accident? Here, Coolmuster iPad iPhone iPod to PC Transfer can help you export anything on your iOS devices to computer with one simple click. Please be noted that iTunes should be installed on your desktop computer for using this program. Transfer contacts, text messages, notes, Safari bookmarks, songs, videos, playlists, photos, audiobook, eBooks, TV shows, etc. from Apple's iPhone, iPad, iPod touch/nano/shuffle to PC at ease. Fully compatible with all generation of iOS devices, including the latest iPhone X, iPhone 8, iPhone 8 Plus, iPhone 7 Plus, iPhone 7, iPhone 6s Plus, iPhone 6s, iPhone 6, iPhone 6 Plus, iPhone 5s, iPhone 5C, iPhone 5, iPad Pro, iPad Air, iPad mini, iPad with Retina display, iPod touch 5, etc. A fantastic way to manage iOS data on computer instead of portable devices. Tired of view files in the same way? Let's change it now! This iPad iPhone iPod to Computer Transfer program comes with two different view modes: Selectable thumbnail and list view modes. You can choose one of them to view files on your iDevices as you like. Thumbnail View Mode: All files will have a mini picture so that you can easily and quickly find the target document among other files. List View Mode: Files will be displayed in the main interface with details, such as file size, name, author info, time, etc. Once you connect your iOS devices to computer, you'll find all files on your iPad, iPhone and iPod will be divided into different folders in the left panel. Under this situation, you can find the file according to the file type. In the top of the panel, you'll find a searching box. Here, you can enter the file name and then this app will automatically search and locate the file for your reference. 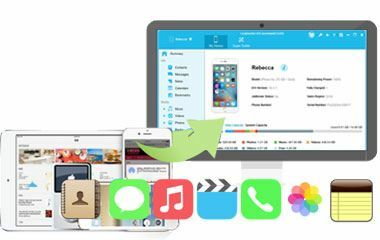 For an Apple's fan, managing files on iOS devices is a simple task, but if you're a beginner, you may be frustrated of how to manage videos, music, photos, etc. with your devices, like how to export iPad photos to computer, how to backup contacts/SMS on iPhone, how to import contacts/calendars/bookmarks from iOS device to computer, how to share iOS files with friends, etc. right? Then, don't worry. This recommended tool could be an ideal solution for the problem. One click to export anything on your iOS devices to computer. After that, you can rename your file name, upload or share your favorite music or movie files with your friends on PC without any limitation. Effortlessly import any files to your iOS devices from computer without any restriction. 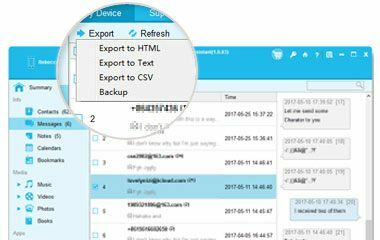 You are allowed to import contacts, calendars, bookmarks and more from computer to your iPhone/iPad/iPod devices. 100% safe solution for transferring files from iPad, iPhone and iPod to PC. It is unnecessary for you to worry about the viruses, adware and spyware. No require of professional skills for both beginners and experts. So you can handle it as easy as 1-2-3. No matter how many files you want to transfer, you can export them to computer with one click. For every register users, you're enabled to upgrade your software regularly free for lifetime. Transfer all kinds of files from iOS devices to computer easily, including music, movie, photo, books, etc.